2. Total Weight: About 9000kg. 4. Main forming unit driving motor power: 7.5kw. 5. Curving motor power: 4+1.1+1.1. 6. Electric cutting power: 3kw. 7. Material of roller: 45#steel, quenched HRC58-62. 8. Material of roller shafts: 45#steel, adjusted. 9. Material of cutting blade: Cr12. 10. Step of rollers: 13 steps. 13. The depth of the groove: 109mm. 14. Thickness of the coil: 0.6-1.5mm. 15. Working speed: Straight sheet: 1 5m/min. The ZX-305 large span curving roof roll forming machine has PLC controlling system and is mainly comprised by decoiler, forming unit, cutting device, curving unit and output tables. 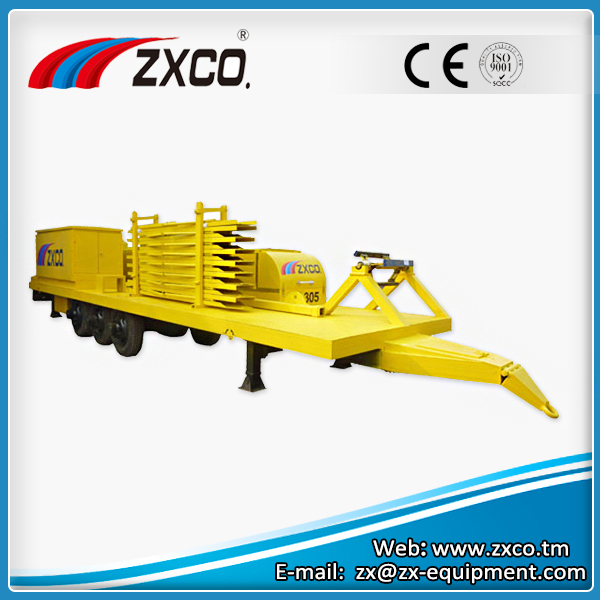 Since all the parts are mounted on a mobile pedestal, it is suitable for any construction site.